Meridian Academy student Kenneth Allen, 12, adjusted his robotics project. A group of science students walked from their classroom, across the Charles River, to see a robotics exhibition at MIT. Some eighth-graders studying the US Constitution took the MBTA to South Station to interview passersby about new amendments the students had drafted. A group of humanities students went to an East Boston radio studio to record commentaries they had written about modern-day colonialism. “This is sort of our home base, but the city is our extended campus for the kind of work we’re doing,’’ said Joshua Abrams, the founder and head of school at Meridian, now in its seventh year. Meridian, however, is most remarkable for what it does not do: grade or test students, calculate grade-point averages, or ring bells to signal the end of classes. Abrams and other founders of the school, which has 34 students in sixth through 12th grades, believe that students learn best when their academic career is not measured by how well they memorize information and quickly repeat it back on tests. The leaders and staff at Meridian see their school as the antidote to the movement toward more standardized testing. In this state, public school students are required to take Massachusetts Comprehensive Assessment System exams beginning in elementary school, and must pass several in high school before they can graduate. Teachers at Meridian Academy evaluate students on long-term projects that the students present to parents and faculty at the end of each term. Children in a science class taught by Abrams, for example, will create a robotic miniature golf course for their final projects this spring. In Spanish, which is required, students wrote short stories in that language, and then translated them into English, for their term projects. The biggest assignment takes place in 11th grade, when students come up with their own projects and work on them throughout the year. Teachers must approve the topics, but the projects can come from any discipline. Peter Gray, a research professor of psychology at Boston College, said some of the ideas at the core of Meridian’s philosophy - fewer evaluations, learning by working on projects, allowing students to learn by making mistakes - are not new. “I think that those elements have always been a part of what’s called progressive education,’’ Gray said. More parents are pulling their children out of public schools and home-schooling them; it may be that progressive schools are becoming more popular, he said. Gray also said that there has been some backlash against the growing use of standardized tests in public schools. “Suddenly kids became pawns in some great competition to see who can squeeze the highest test grades out of them,’’ the BC professor said. At Meridian, school officials believe it is important to teach students to be persistent, to allow them to tolerate frustration. Most complicated projects, Abrams said, involve getting stuck and figuring out a new way to move forward. Jake Bernstein, a ninth-grader from Milton, remembered a series of experiments last year on energy that didn’t always work. Bernstein had originally planned to attend Meridian through middle school and return to Milton for high school. But he was so passionate about staying at Meridian that his parents acquiesced. 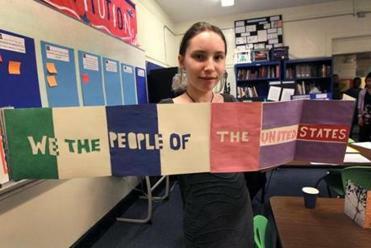 Juliette Parmenter, also a ninth-grader, was in a similar position. She came to Meridian three years ago instead of going to middle school in Newton, where her older sisters had had a difficult time. But rather than return to her hometown and start at Newton North High this fall, she begged her parents to keep her at Meridian. Meridian is still a young school. After starting out in a church basement in Jamaica Plain in 2005, its classrooms are now on the third floor of Temple Ohabei Shalom’s school building in Brookline. The academy graduated its first class of seniors last spring. Janasha Goffigan-Holmes was one of those graduates, and she is now in her first year at College of the Atlantic in Bar Harbor, Maine. Once she switched from public school in Dorchester to Meridian - in the school’s first year - she saw a dramatic difference in how school was taught, she said. Goffigan-Holmes said she was worried that her untraditional high school and lack of a grade-point average might make colleges wary. So she applied to 11 schools. She was accepted at most of them. Her favorite class at Meridian was marine science in ninth grade, when students built their own estuaries. Now she is studying marine biology. Some potential students and parents also worry that colleges won’t consider applicants from Meridian because they have no grade-point averages. (Meridian students still take the SATs, and do well on the standardized exams - their average score is above 700.) Since they attend private school, they are not required to take the MCAS tests. But last year, none of the students had problems during the college application process, Abrams said. About 60 percent of its students come to Meridian from Boston, and the rest from area suburbs. About two-thirds of the students have previously studied in public schools. The academy combines math, science, and technology into a single course that applies what the students learn to real-life problems, such as building robots. 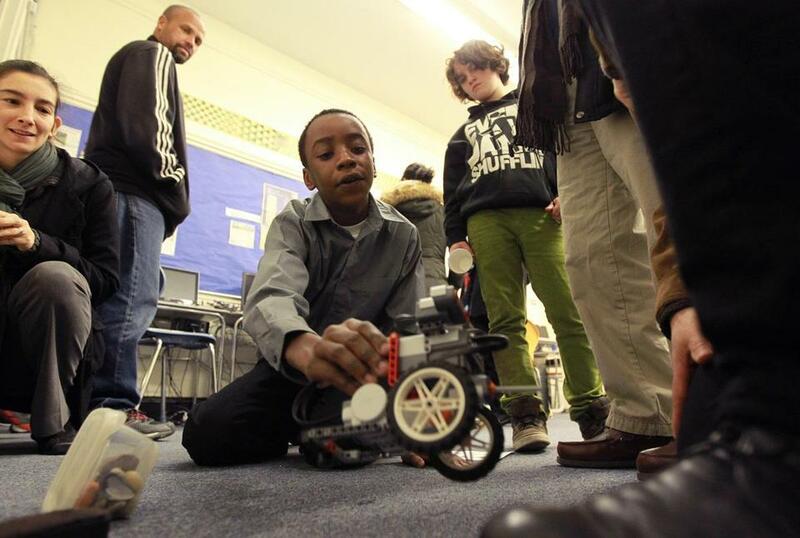 Earlier this year, the sixth- and seventh-graders took part in the Robot Olympics. “They’re not learning algebra as sort of a set of discombobulated, unrelated skills,’’ said Abrams.